Wiley Post’s pressure suit allowed him to cruise for long distances at high altitude in the jet stream, and was a precursor to modern pressure and space suits. On March 15, 1935, Post flew from Burbank, California, to Cleveland, Ohio, a distance of 2,035 miles, in 7 hours, 19 minutes. At times, the Winnie Mae attained a ground speed of 340 mph, indicating that the airplane was indeed operating in the jet stream. He reached an unofficial altitude of more than 50,000 feet. 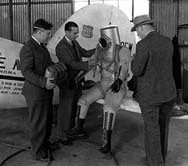 (right) In this photo, Wiley Post is at the far left as the suit is pressurized for testing. The Winnie Mae is in the background. The suit is in the collection of the National Air & Space Museum and is not currently on display.